Three out of four voters want change: but what does that mean? We asked the 76% of voters who said they preferred to see a change in government, whether they preferred ambitious or moderate change, and change that would be felt soon, or more gradually. We also asked which of the Liberals and New Democrats looked best positioned to deliver the change they were looking for. • People are split on the scale of change they want, with 50% wanting moderate change and 50% wanting ambitious change. In Quebec, the majority wants ambitious change; in BC it’s the opposite. 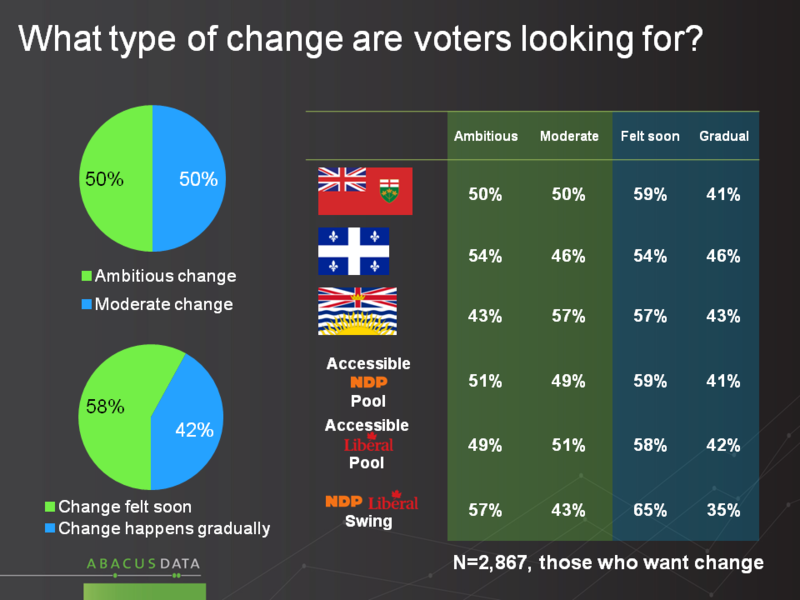 But perhaps most important is this: among voters who are going to choose only between the NDP or Liberals, 57% want ambitious change, compared to 43% who want moderate change. • Most (58%) favour change that would be felt soon, rather than more gradually (42%). This is the consensus in all three of the largest seat provinces. Among NDP-Liberal swing voters, 65% want change sooner rather than later. • Justin Trudeau is seen as the leader who represents ambitious change (63%) and change that will be felt soon (60%). Thomas Mulcair is more identified with moderate change (60%) that will happen more gradually (59%). This puts the NDP leader at a disadvantage to Mr. Trudeau among the Liberal-NDP swing voter. 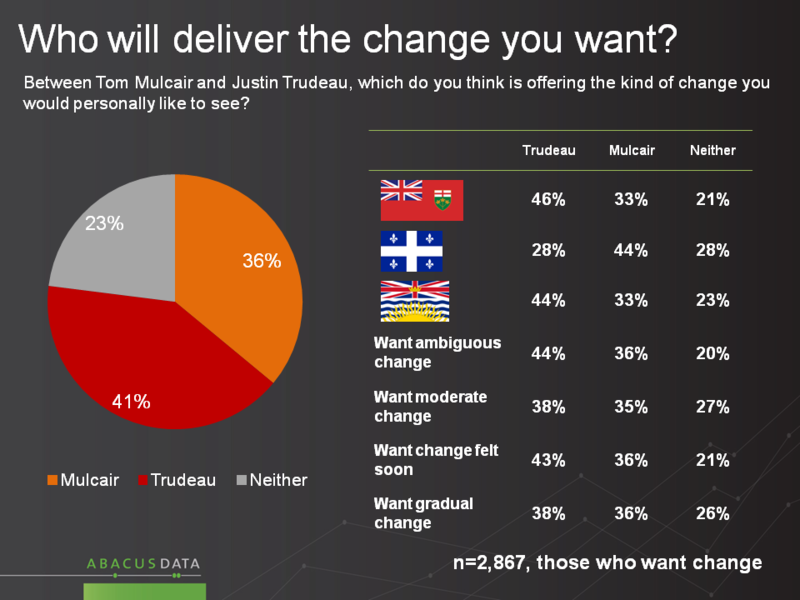 • When asked which leader is best able to deliver the change they want, 41% of change voters say Justin Trudeau, compared to 36% for Thomas Mulcair. Mr. Trudeau has a substantial 46%-33% lead in Ontario, and leads in BC (44%-33%), while Mr. Mulcair has a sizeable lead in Quebec (44%-28%). • Among those who want change that happens soon, Mr. Trudeau leads 43% to 36%. Among those who want gradual change, the two are about even (38% vs. 36%). • Most people doubt things would be worse with a change to a Liberal or NDP government. The range of fearful voters is 17% to 30% for the Liberals, and 15% to 31% for the NDP. • These perceptions show deterioration for the NDP and improvement for the Liberals since July. The Liberals have improved 9 to 11 points in perceptions that they would improve the rate of economic growth, job creation and keep taxes low, when compared to the Conservative government. The NDP have lost ground on keeping taxes low and keeping Canada safe from terrorism. It may well be that the rest of the campaign turns on two themes: a Conservative effort to promote concern about the consequences of change and an effort by the two main opposition parties to harden the desire for change and define the most appealing version of change. The fear of change has grown a bit in the case of a prospective NDP win, and has lowered when it comes to the prospect of a Liberal win. Overall, the fear of change is fairly limited. Thus far in this campaign Liberals have out-positioned the NDP among change voters. For those who want ambitious change and to feel it soon, the Liberals have established stronger credentials: remarkable given the traditional relationship between these two parties. At the same time, among those who prefer more modest and gradual change, the Liberals are competitive with the NDP. As the leaders battle for the roughly 30% of voters who say they will only vote NDP or Liberal, this may be the topic to watch as Election Day draws nearer. Our survey was conducted online with 3,814 Canadians aged 18 and over from 9:30 pm ET on September 24 to 3:00pm ET on September 27, 2015. A random sample of panelists was invited to complete the survey from a large representative panel of over 500,000 Canadians, recruited and managed by Research Now, one of the world’s leading provider of online research samples. The Marketing Research and Intelligence Association policy limits statements about margins of sampling error for most online surveys. The margin of error for a comparable probability-based random sample of the same size is +/- 1.6%, 19 times out of 20. The data were weighted according to census data to ensure that the sample matched Canada's population according to age, gender, educational attainment, and region. Totals may not add up to 100 due to rounding.